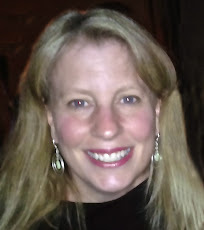 I'm so excited to be hopping with the Unity Design Team on their Thursday Blog Hop today. My card won the Unity Be Inspired Challenge last month and each monthly winner gets to participate in the Unity Thursday Hop! The Hop starts at the Unity Blog. Be sure to comment on all the participants blogs to be eligible to win the awesome Hop prize. 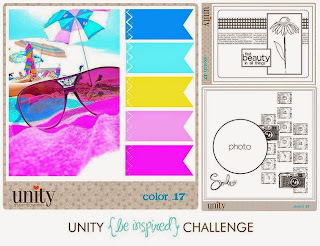 The graphic below is for the current Unity Be Inspired Challenge, here is the link http://www.theunitystampco-challenge.blogspot.com/ I hope you will consider playing along with the current Unity Be Inspired Challenge. It's so much fun and the prizes are amazing - 4 Kits and 10 Itty Bittys!! 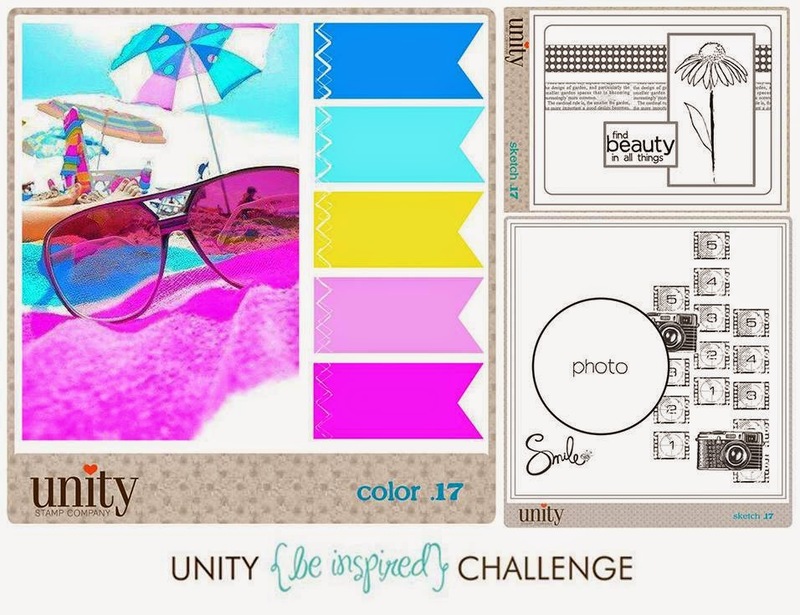 Under the graphic are the cards I made for this month's Unity Be Inspired Challenge. I made two cards using that bright and fun color story. The first one uses this fun Subway Art graphic from the Unity Mach 2014 SMAK Kit. I've been wanting to use it forever now and this was the perfect opportunity for me. First, I colored in all the images with Copic Markers. Then I added 2 wood arrows from Studio Calico (the pink one and the blue one), various rhinestones, enamel dots, and Stickles everywhere!! It was so much fun to make and I really like how it turned out. The blue corrugated cardboard paper is from DCWV. For my second card from this color story I used the Unity May 2014 Kit of the Month. I had to have this kit when I saw this girl holding the balloons. It's such a cool stamp. The girl with the balloons stamp and the sentiment are both from the Unity May 2014 Kit of the Month. I adhered the girl and the heart with foam dots. I sprayed the white card stock with Lindy's Stamp Gang Spray in Tilt a Wheel Teal. The pink card stock is from the DCWV Spring/Summer Stack. The banner and heart are from the Heidi Swapp Color Magic Collection - Paper Goods - Ephemera. I sprayed them with Heidi Swapp Color Shine Spritz in Primrose. I also made a 2 cards with the current card sketch. For this one I used this hanging dress from the Unity May 2011 Kit of The Month - honestly these Unity KOM stamps never get old to me. I want to say it's one of my favorite KOMs, but they are all on my favorites list. Unity KOMs just ROCK!!! The sentiment is from the awesome Unity March 2014 Kit of the Month. 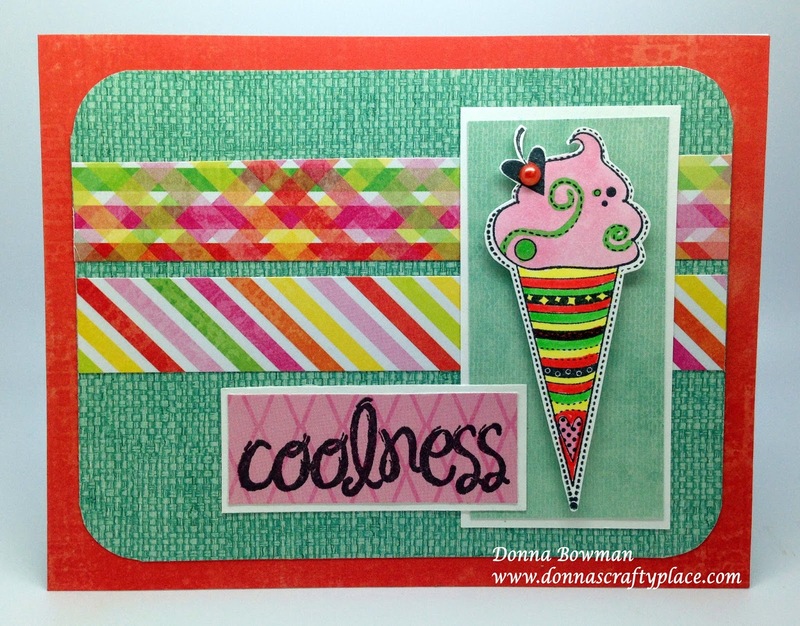 For my last card I used this fun ice cream cone from the Unity July 2011 Kit of the Month and the Coolness sentiment is from the Unity March 2014 SMAK Kit. It's so far my only SMAK kit, but I absolutely love all the graphic images in that kit. The ink is Memento Black and all the papers are from DCWV Spring & Summer Stack. I adhere the cupcake with foam dots and added a little matching pearl to the heart on the top of the ice cream cone. I think it make a super fun summer card. 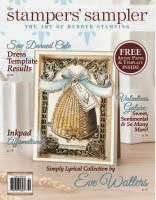 How exciting to be the guest designer, and play along with so many talented ladies and use FABULOUS stamps. Your projects are wonderful. Love the subway art! Cute cards & congrats to you! Hip hip hooray for you on being the Guest designer ! Your first card is my favorite but they all are terrific. 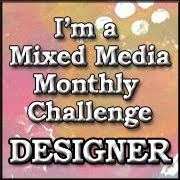 Congrats on winning the challenge and being today's guest designer! Great cards! Love the lady with the balloons. I can see using that on so many different cards. She's beautiful. The subway art is fun. The hanging dress could be fun between friends. Thanks for sharing and congratulations on winning. Oooh, love all of these designs but that Subway Art card is my favorite with all the mixed fonts and splashes of color! Great cards! Love that they're so colorful! Great cards! Thanks for sharing them with us! Great colors in the Subway Art card, love the girl holding the balloons and the hanging dress, and that ice cream cone is just adorable! Great job on all your cards, Donna! Your cards are so much fun! I especially love the subway art stamp and that ice cream cone is the cutest! Congrats on your win. With such great cards, I can see why. Your cards are amazing Donna, a BIG Congrats on your GD gig! Love the bright colors. Great ideas. Fabulous cards! Love the Subway art! Congratulations on your win! Congrats on winning the challenge - your cards are great - bold and fresh! 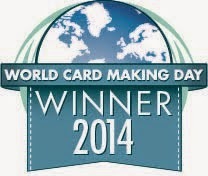 Great cards, congrats on your win! Goodness Donna, all of your cards are FABULOUS!!! Thank you so much for sharing your talent with us today. Hugs. LOVE all of your creations for the hop. I'm so happy to have hopped with you and look forward to seeing your talent in the future. Oh my goodness, fabulous creations! Awesome-ness Donna! You made some fabulous cards and your challenge cards (especially the first one-my fav) is right on. Congrats agan on your win last month and loved having you hop with us. Congrats on your win and beautiful cards! Congrats on your win! All your cards are lovely! I love all your cards! That subway art stamp is really fab! The colors are so eye catching-adorable. LOVE IT! That first card is fantabulous! I live the way you use color. Your cards are so much fun! Wow, these are all terrific. I love all the bright colors. WOW all the pretty colors!!! Oh my goodness! These are all so awesome! I am in love with the background of the ice cream cone card! What is it? Burlap? Is it patterned paper? Wonderful! Congrats on the challenge win and chance to hop with Unity! I love all of your cards but that subway art one is my favorite, just pops with energy! Great cards. Love the girl and balloons as well as your ice cream cone. Your colors are great! Love all your brightly colored cards! Great stuff! fantastic cards!! the girls are so beautiful!! you have colored them very beautifully! Your cards are delightful, especially the first one with all the lettering. The color scheme look like it would be a lot of fun to work with. Blessings! What fun cards! So pretty and colorful! 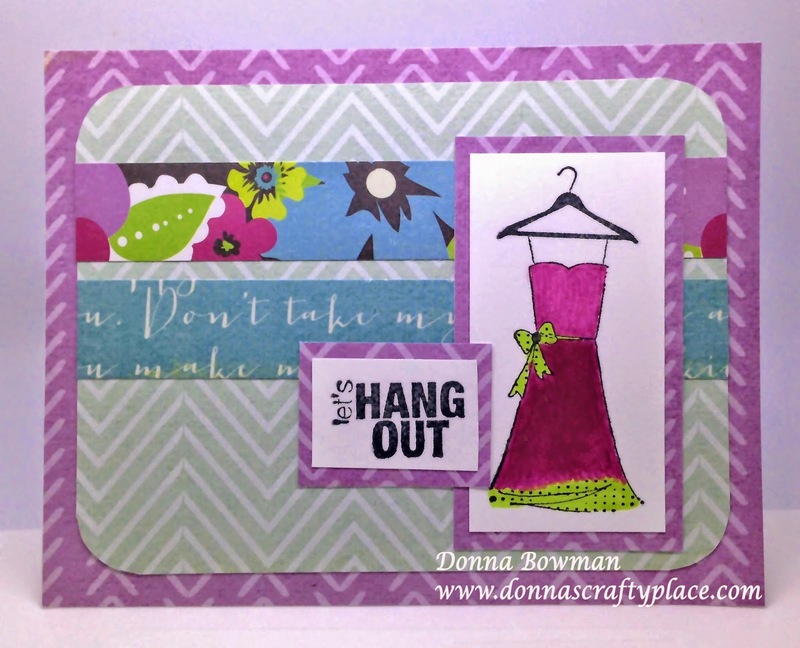 What gorgeous and creative cards, Donna! Congrats on your win and hosting too! My goodness, those are some gorgeous cards! Congrats on being guest hopper! Love all the bright cards!! Congrats on your win! congrats on such an amazing hop with unity! your cards are great and the dt really really enjoyed having you! !